The holidays are just around the corner. I support local stores when I can, but for some presents I go online. Before I decide what to buy, I read the reviews. The more time I spend online, the more confused and frustrated I become. There is there a better way. I will share with you my approach for navigating the review jungle to make better decisions. You can use the same approach to make any kind of decision at work or at home. There are dozens of sites containing hundreds of reviews for any product or service. I can barely skim the surface and am left with a nagging feeling I am missing important information. To cut through the noise, I try to search only on reputable sites and limit the number of reviews I read. For decisions at work or at home, seek advice from a small number of carefully-chosen people. In choosing people as advice-givers, keep in mind what their interest (bias) in your decision might be. When we choose one option, we are also deciding against all the alternatives. Economists call this opportunity cost. I call it decision pain. Choosing the best alternative becomes difficult or impossible as the number of attractive options increases. Psychologist Barry Schwartz notes in The Paradox of Choice that having too many alternatives leads people to defer or avoid decisions. Looking for the perfect product or idea is an impossible battle. Satisficing is the art of knowing when good enough is good enough… and stop searching for perfect. I stop my online research as soon as I find a product that meets my minimum acceptable criteria for features, quality, price, etc. There may be better or cheaper alternatives out there, but the opportunity cost I would pay for looking for them is not worth it. Set a minimal threshold for the benefits you seek and choose the first alternative that meets that threshold. Reviews are biased. I’m not talking about Uncle Eddie’s review of his nephew’s restaurant, “the best cannelloni in the world.” Most reviews are not intentionally deceptive. Reviews (and any other kind of advice) suffer from cognitive biases that affect our decisions and relationships. After choosing an option, we amplify positive aspects while downplaying negative aspects of that option. This occurs subconsciously through choice-supportive bias. When I bought my first iPhone, I loved the design and user experience. I ignored the fact that synchronizing files (outside of iTunes) was difficult. Years later, when I bought a Samsung Galaxy, I raved about the ease of synchronizing with Windows and overlooked the fact that my favorite music recording apps did not yet exist for Android. The overwhelming majority of reviews are positive. This is especially true for expensive, luxury products. The people who bought them are biased to love them. They may write positive reviews to congratulate themselves on having chosen a “great” product. Max Woolf found that more than half of the 1.2 million reviews of electronics products on Amazon.com between 1995 and 2013 gave the product 5 stars. A product with 1,000 five-star-reviews is probably not a bad product. However, the positive reviews will fail to point out any drawbacks with the product. There will also be negative (one star) reviews written by people who feel cheated when the product fails to deliver its promised benefits. Far fewer reviews will be in between. First, I look at the shape of the review curve. I start with the worst reviews, looking for information that is a deal-killer. “The suitcase smells like chemicals.” No thanks. “The socks fell apart after the first washing.” Next, please. When a product passes the worst-review test, I move on to read a few positive (five star) reviews. I ignore general praise such as “fantastic product” or “great experience.” Doesn’t help. I am looking for confirmation that the product offers the specific benefits I want. “The suitcase is sturdy yet lightweight.” Bingo. “Home-cooked food in an unpretentious atmosphere.” Let’s go. The most unbiased information comes from the (few) reviews in the middle. These are written by people who are neither dazzled nor disappointed by the product. When someone says in a three-star review, “the chemical smell disappeared after a week,” I believe it. To get a balanced picture, ask three people for their advice before making a major decision. Ask someone who has decided in favor to learn what the potential benefits may be. Ask someone who has decided against to discover the drawbacks. Ask someone who has not yet decided to learn about decision criteria and alternatives. Gino F. (2013). Sidetracked: Why Our Decisions Get Derailed, and How We Can Stick to the Plan. Boston: Harvard Business Review Press. Schwartz, B. (2016). The Paradox of Choice: Why More is Less. Revised Edition New York: Harper Collins. Woolf, M. (2014, 17 June). 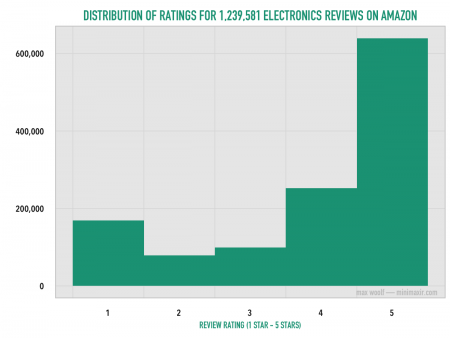 A Statistical Analysis of 1.2 Million Amazon Reviews.